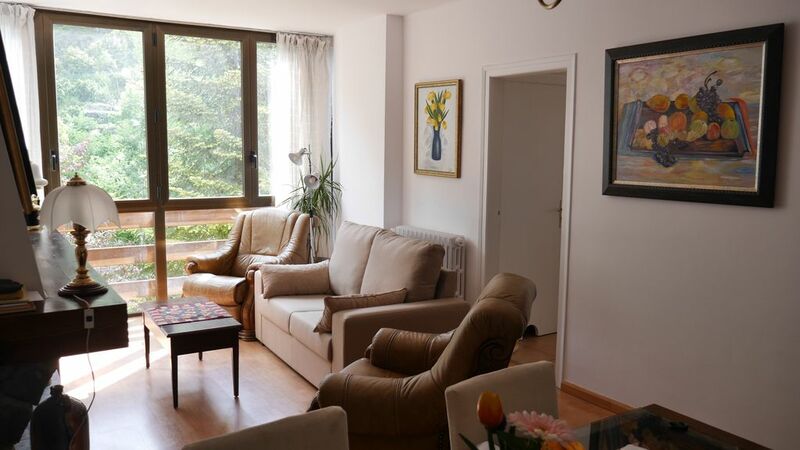 The apartment in La Massana has 2 bedrooms and has capacity for 4 people. The apartment is cozy, is fully-equiped, and is 72 m². It has views of the mountain. The property is located 10 m from Restaurant Prat del Colat , 20 m from the , 200 m from Funicular Pal skiing resort, 200 m from La Massana city, 400 m from Garralla supermarket, 400 m from the bus station, 3 km from Ordino city, 5 km from Vall d´Ordino Golf Club golf course, 6 km from Pitch & Putt Xixerella golf course, 7 km from Andorra la Vella city, 9 km from Encamp city, 41 km from L´Hospitalet prés l´Andorre train station, 154 km from Lleida Pirineus train station, 197 km from Toulouse Blagnac airport, 205 km from Barcelona El Prat airport. The house is situated in a well connected neighborhood in the center of the city. The accommodation is equipped with the following items: lift, iron, internet (Wi-Fi), hair dryer, central heating, covered parking in the same building, TV. In the electric independent kitchen, refrigerator, microwave, oven, washing machine, dishwasher, dishes/cutlery, kitchen utensils, coffee machine, toaster, kettle and juicer are provided. Supplement for arrivals past 21.30hs of 30€. It is paid upon check in in cash.